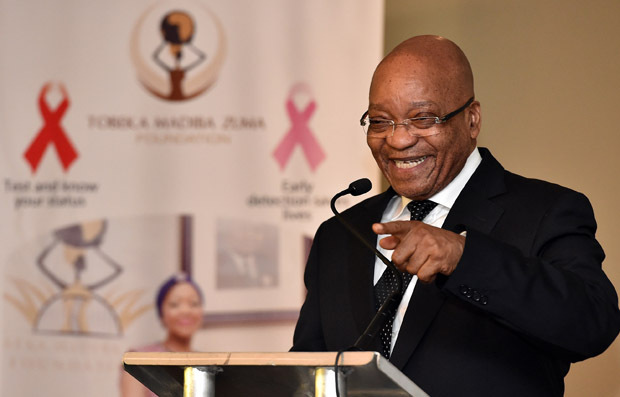 President Jacob Zuma was let off the hook on Thursday after the National Assembly Speaker Baleka Mbete prematurely adjourned the House because of repeated Economic Freedom Fighters (EFF) disruptions. The EFF disruptions in parliament prevented Zuma from answering any of the scheduled questions. Even after a lengthy first adjournment, the EFF was still adamant that it would not rest until Zuma responded to the “pay back the money” Nkandla matter. The EFF had repeatedly called for Zuma to respond to questions on Nkandla, despite the questions not having been tabled on the question paper for the sitting. Mbete called for a sergeant at arms to remove an EFF MPs after the session was again disrupted. “It began at the start of the sitting at 2pm where the EFF really rolled out a surprise plan of disrupting the sitting by raising issues of Nkandla and so on. If they don’t participate [in placing their questions] it’s based on their own decision to participate or not,” said Baleka. “There are those that have come to this parliament to undermine the will of the people of this country. At this point… we can’t go on like this. I would like the house to be adjourned until we take a different decision,” she said. This caused the ire of fellow opposition parties which were infuriated that their opportunity to hold Zuma to account on other issues had been quashed. IFP MP Narend Singh said the party agreed with the gravitas of Nkandla but processes had to be followed. “We all agreed that business of the day was questions to the president. On the order paper; as printed,” he said. ACDP MP Cheryllyn Dudley said her party objected to being held to ransom by the EFF. EFF MP Floyd Shivambu said the party was refusing to accept the decision of other political parties. “We can’t just sweep that issue under the carpet. The president [Zuma] must give us accountability as to when he is going to pay back the money. We can’t be steam rolled… He makes mockery and jokes… The people of South Africa are not expecting us to be protecting chickens and cattle,” he said. After the red-clad EFF continued to call and gesture for Zuma to pay back the money, Baleka adjourned the House. This was not before she had called for the sergeant at arms to remove a member. At an urgently convened press briefing on Thursday night, Mbete said she had called in the sergeant of arms to remove an EFF member but had not called in the police. It was important for the public to see the behaviour of the members. “It’s always on the back of our minds [to call in the police]… it didn’t pose itself as an option today. Occurrences do unfold… It’s good to allow the public to observe occurrences. “I didn’t consider the police to throw people out,” said Mbete. She said it was not a “smooth sailing process” to determine when Zuma, who still had to respond to questions, would address parliament again.